Jeremy McGrath’s decision to retire from professional motorcycle racing earlier this week (which will be announced officially later today at Edison Field in Anaheim, California) both shocked and saddened the motorcycle community, and a fan base that is easily the largest of any motorcycle racer in the United States. It is probably safe to say that McGrath dominated at the highest level of motorcycle racing more than any rider in history. Certainly, the highest level of supercross racing, but no roadracer in the modern era (Mick Doohan probably comes closest) achieved the level of dominance McGrath did in the stadiums. Indeed, my personal memories of McGrath (as a supercross fanatic throughout his career) relate more to his losses than his victories. His victories were that common and predictable. I remember, for instance, the brief challenge of McGrath by Mike Craig (I believe it was 1994), when Craig showed the ability to run McGrath’s pace. That ability didn’t last, unfortunately, due at least partly to injuries Craig suffered during his career. 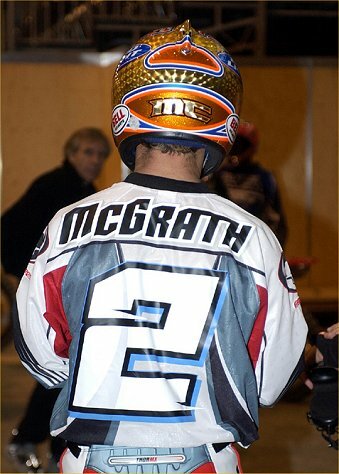 I also remember McGrath’s switch to Suzuki for one year, and his loss of the championship that year to Jeff Emig. I believe that was 1997, and McGrath just barely lost the championship that year despite some very unlucky races, including an opening round crash-fest involving teammate Steve Lamson and others, as well as a flat tire in another round. McGrath’s next challenger in the stadiums was Ezra Lusk (then on a Honda). Although Lusk has not won a supercross championship, he clearly had the measure of McGrath, and beat McGrath, at several races during the late ’90s. Lusk’s own efforts to obtain the AMA Supercross championship were severely hampered by injuries. Which brings to mind another aspect of McGrath’s career — a remarkable lack of injuries (until more recently). Undoubtedly, another testament to McGrath’s extremely high level of skill on a motocross bike, McGrath almost seemed immune to serious injuries that frequently plagued his competitors. For many years, McGrath simply did not crash, much less crash hard and injure himself. Another personal memory of McGrath when I saw him (as other fans saw him — I was not a journalist at the time) was his patience with fans, particularly children. He always tried to make children feel special when they met with him — never acting distracted or rushed. Indeed, McGrath never developed the ego problems we see in many star athletes. Despite every reason to become one, McGrath was never a prima donna. He was very proud of winning, however, and would seem shocked when he lost — understandable, given the infrequency of that occurrence. We won’t try to chronicle all of McGrath’s records here, except to mention two. He has the most AMA Supercross championships (seven), and the most AMA Supercross main event victories (by a very large margin). Due to his exalted status in the sport, he was the first rider to negotiate a “supercross only” contract, and the first factory-level rider to own his own race team. While the torch has been passed to Ricky Carmichael as the sport’s most dominant rider, McGrath’s career, his records, and his personality will never be forgotten.